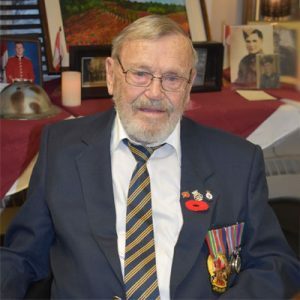 It is with great sadness the family of Edward (Ted) George Whitehead announce his passing on January 23, 2019 in Kelowna, BC. He leaves to mourn his loving wife June, and 13 children, including Colin (Alice), Shelly (Nick), Susan (Marty) Thorne, Ross (Lynn), Grant (Lendy), Lorna (Gary), Evan (Lillianne), Louie (Jennifer), Warren (Debbie), Ken (Linda), Judy, and Geri, 35 grandchildren, 45 great grandchildren, 1 great great grandchild and many very special foster children. He was predeceased by his daughter Sandy in 2002 and wife Bessie in 2003. Ted was born on February 6,1928 in Calgary, AB and grew up in Grandview Bench, BC. At age 14, he entered the Merchant Marines and after the war ended, he returned to the Grandview Bench area with an automotive ticket. For the following 20 years, he worked at logging and managing fruit orchards. In the early 1960’s, Ted followed his brother Herb to Burns Lake, BC, soon settling in Fraser Lake, BC, where he worked first at Endako mine, then for the Dept. of Hwys, from where he retired at the age of 60. He returned to the Okanagan area in 2005. Ted was a wonderful man and will be sadly missed by so many.